Some days you just have to be silly. Half way through cooking yesterday’s dinner, I felt it was incomplete. It need a little something extra. Something light and fresh. By the time I thought this, it was already dark outside. I didn’t feel like picking a salad in the dark, so I thought I might make a fruit salad. But neither the bananas, nor the pears in the fruit bowl were ripe yet, and that left just apples and mandarines. Pretty boring fruit salad. How could I make plain old apples exciting? 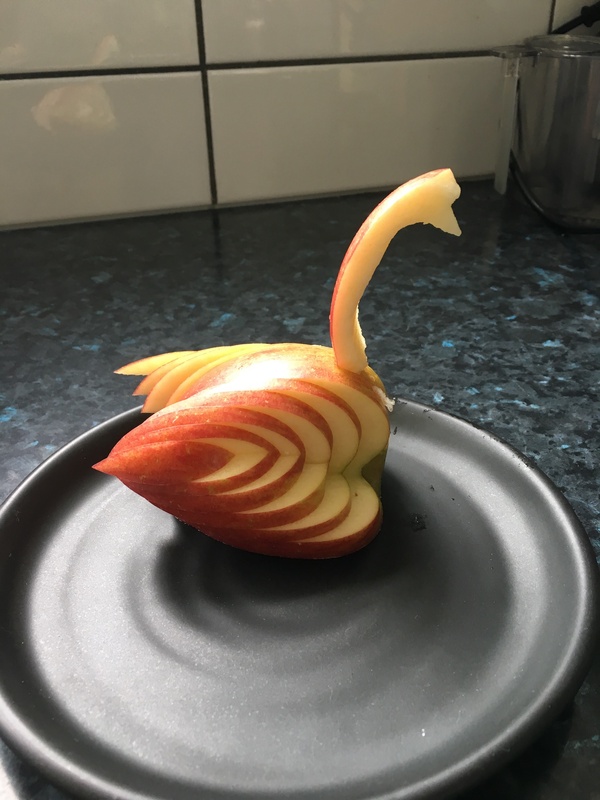 Turn them into swans, of course! I found instructions for these fun little fruit birds on the Curious Little Kid blog. Hers are much prettier than mine, but mine got a laugh at the table all the same. They turned boring apples into an exciting side dish. An online magazine for fanfic readers and writers. Poetry International is a world class literary magazine based on the campus of San Diego State University which caters to an international community of poets.